WIGAN’S ChinaMex dream is over. After confidential talks, senior councillors have decided to look for other uses for the former Westwood power station site. They say they took the decision because approaching five years after signing a heads of agreement and receiving full planning permission, developers China Gateway International (formerly Commercial Group Properties) has yet to cut the first ceremonial sod. The £125m textile city scheme – an import/export and manufacturing hub for the Chinese textile industry complete with hotel and casino – was announced amid firecrackers and dancing Chinese Dragons at Haigh Hall. The project was predicted to have created more than 4,000 jobs in the borough and the wider Greater Manchester region. However the £10m sale of the 20-hectare site has never gone through. And China Gateway International has prioritised another 1.4m sq ft Chinagate-way scheme in Manston, Thanet, ahead of the Wigan proposal. It was given planning consent by Thanet District Council last October, and said “a significant part” had already been pre-let. 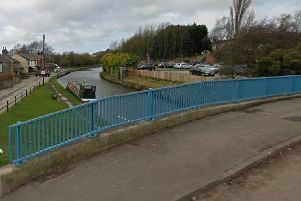 The scheme received another body blow last year when it was announced it faced being gazumped by a rival project from Trafford Centre owners Peel Holdings on former docklands at Birkenhead or Ellesmere Port. Ironically Wigan’s ruling cabinet, sitting in private, took the decision just days after Manchester Airport (part owned by the council) announced a partnership deal with Bejing that will make the airport – just 30 miles from our town – Britain’s main air portal for Chinese passengers and air freight trade. The agreement is set to open up a wealth of trade and tourism links to the Far East, and will see Manchester Airport named the official “sister” airport of Beijing Capital International Airport, now the second busiest in the world. The deal will also bring the first direct flights between Manchester and China, with at least one daily flight – probably to Beijing – being launched, creating aropund 250 jobs. There was no comment from China Gateway International. But Council director of the economy Stephen Normington said today: “While the Chinamex scheme remains a long-term aspiration on behalf of the council and its partners, there has been little progress in bringing the project forward. “We are looking at a number of alternative options for the future use of the site that would help to create jobs and boost the local economy. “Cabinet has given approval for us to explore these options in greater detail. The region already has the third largest Chinese community in Europe. And Beijing is the most important aviation hub in China, handling 74m passengers, and last year more than £4bn worth of business was struck between China and the North West.